Last summer I hit the mother load at a barn sale. I had to make three trips to bring everything home. When I say barn sale, I mean the contents of a whole house, an over sized garage, and three barns. I can't even remember everything I bought. Someday I will uncover everything that I stuffed into the corners of my garage and basement and make sense of all of the stuff. I do know that I brought home a bunch of lampshades, lamp bases that need reworking, dressers, and mirrors. 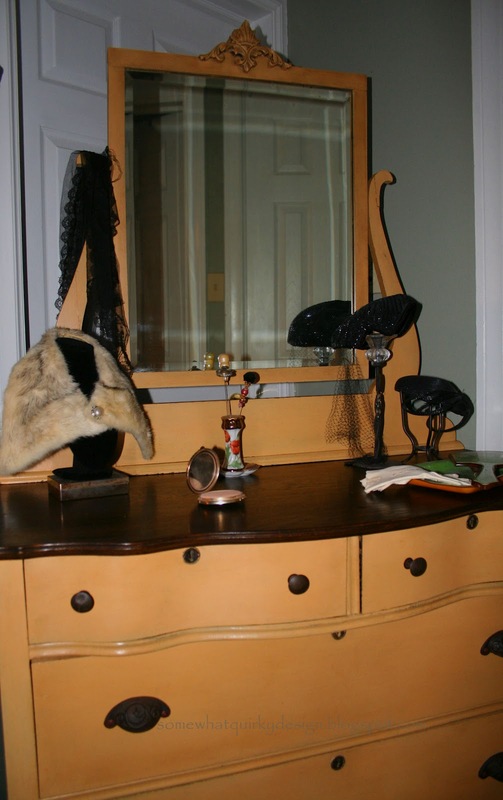 This is the story of the first of the dressers to be rescued. She was ugly - and smelly. Really. Smelly. I did some major sniffing hoping like heck that it was one drawer rather than the whole thing that was reeking. Fortunately only one drawer smelled beyond the ordinary "I'm 50 years old and I've been sitting in a barn for 30 years" smell. Unfortunately, my nose was practically smashed to the wood and I was right in the middle of one heckofa inhale when I realized that this drawer had served as home, nest, and bathroom for some varmint for what smelled to be a very long time. NOTE TO SELF - start sniffing at 12 inches. If you cannot smell it by 6 inches, it doesn't smell. If it smells at 6 inches your face does NOT need to be any closer. I tried a couple of methods to remove the smell. Neither one worked. Waste of time. So I pulled out the drawer base and used it as a template on a piece of nice, clean, very unsmelly 1/8" plywood. This nice fresh wood slid right in and presto changeo the smell was gone. Then, I stripped and sanded the top only. The rest I just scrubbed and then aired out for a week or so. Now it was ready to be transformed. I was looking to replicate the finish I got on the farm table I painted with Annie Sloan Chalk Paint - Arles. I had kind of fallen in love the the mustard color that I ended up with on that. You can see that HERE. 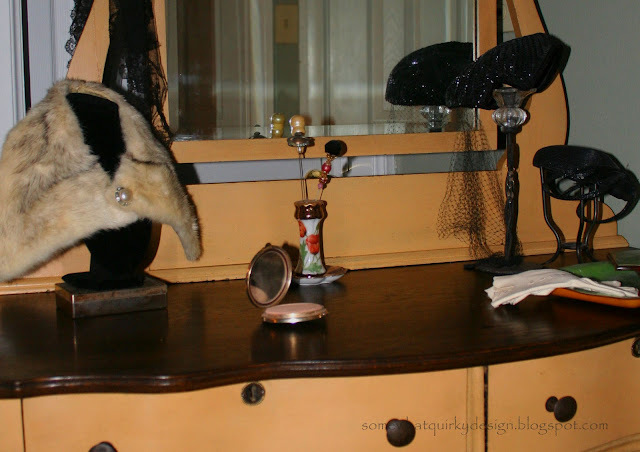 I painted the dresser and the mirror (except the top) with two coats of paint. 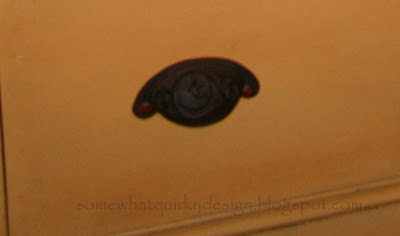 The top was finished with Dark Brown Briwax. I did not use any other stain or wax on the top and was really pleased with the finish I got. It was just beautiful. I'm going to have to order some of the other colors in this product. I really like it. 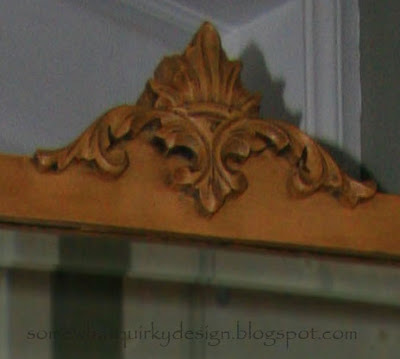 I mixed the dark wax with regular Minwax to do the painted surfaces. Then I used another coat of clear wax and polished it A LOT. I replaced the handles on the bottom two drawers with ones from Hobby Lobby. These handles were without screws and shiny new screws were pretty ugly so I touched them up with some rusty colored paint and a little brown glaze. Note to self #2: close drawers before taking pictures! Remember Sue? These were her hats and hat pins, and she painted the hat pin holder. Love it. I snapped a picture with my phone, sent it to my daughter and asked her if she would like to have it for Christmas. She said "well if you twist my arm....." So I packed crammed it in the Durango beside the dresser I made for my son and headed to her home for the holidays. I gotta say this color fits perfectly in her bedroom - with her Anthropology quilt and textiles from Latin America. I miss her (and my daughter too)! I have a little Arles paint left. Anybody out there have something they have done with this color? Would love to see some ideas. I love this color, it may have to go to the top of my list for the next ASCP purchase! 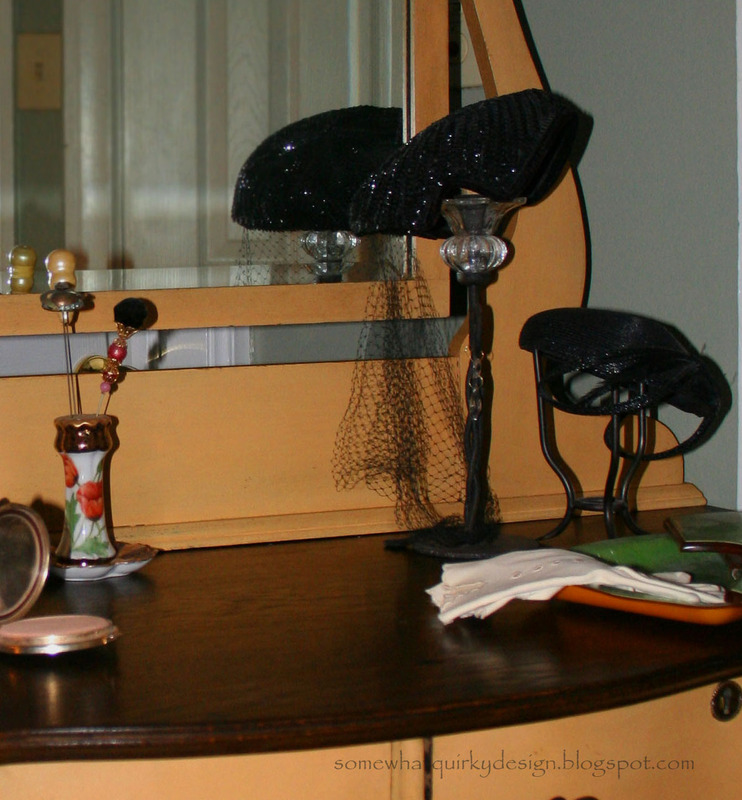 Love the mirror too, I have been looking for something similar for a while now. Lucky daughter!! Lucky girl, this is a great colour. I'm dying to do something with it. Thanks Irene. I'm going to have to read "Sweetness at the Bottom of the Pie" now! So pretty, love the color too. Don`t you just love them barn sales!!! Beautiful, love the contrast with the dark wood and Arles! You did a fantastic job! 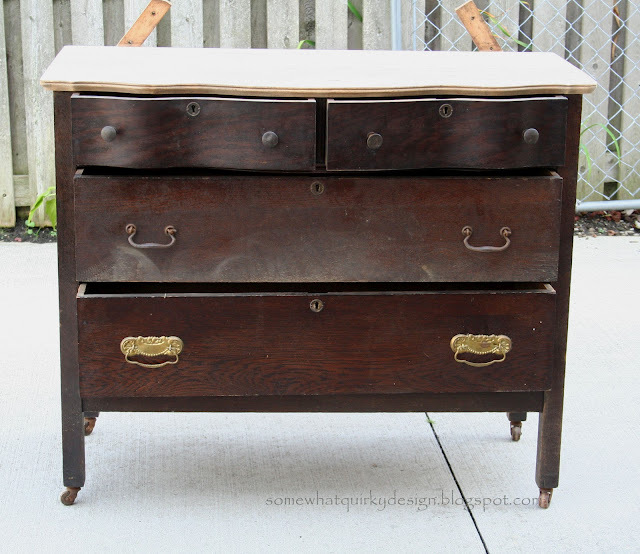 Thanks for linking up at my weekly Chalk Paint linky party!